If you are like most people, you need a car to get around. Unless you live in a big city with a great public transportation system, a car is a definite necessity. Most people need a vehicle to get to and from work. However a car is used for almost every aspect of our daily lives: to go shopping, to get to appointments, to transport children to events, or just to get around for pleasure. Because a car is such an important aspect of our lives, we want cars that are reliable, comfortable, affordable (of course) and maybe even a little stylish. Yet, when the times come to purchase a new vehicle, many people are overwhelmed by the whole experience and often make mistakes. 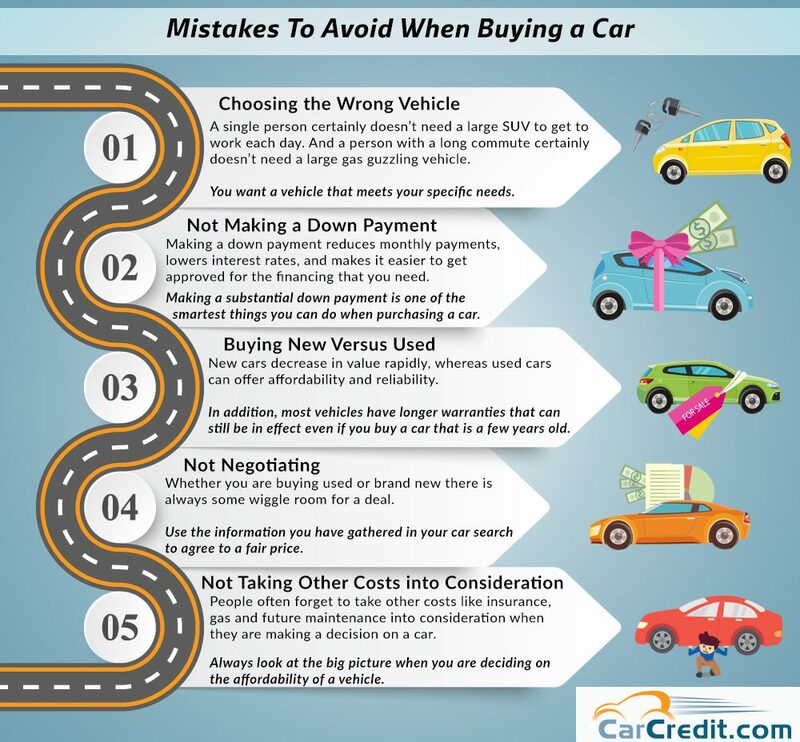 The good news is that most car buying mistakes can be easily avoided. An article on The Balance explains, “When you are in the market for a new car, the vehicle choices are almost endless and car salesmen are notoriously assertive, so finding the right combination of wants and needs with an affordable price tag can be challenging.” When you are shopping for a new vehicle, the best thing you can do for yourself is be prepared. 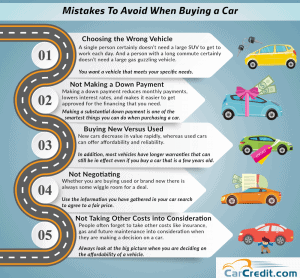 Following are some of the biggest mistakes to avoid when you are ready to purchase your next vehicle. A single person certainly doesn’t need a large SUV to get to work each day. And a person with a long commute certainly doesn’t need a large gas guzzling vehicle. On the other hand, if you have a family, you want a roomy vehicle that fits everyone. The bottom line is that you want a vehicle that meets your specific needs. Vehicles depreciate in value quickly, so when you buy a new vehicle, you can expect it to continuously decrease in value from the moment you take ownership. A used car can offer affordability, reliability and a great opportunity to a large percentage of the population that needs a vehicle but cannot afford an expensive and often over priced brand new car. In addition, today most vehicles have longer warranties that can still be in effect even if you buy a car that is a few years old. If you have the funds, making a substantial down payment is one of the smartest things you can do when purchasing a car. This will not only reduce your monthly payment and possibly your interest rate, but it often makes it easier to get approved for the financing that you need. The purchase price of a vehicle is important but people often forget to take other costs like insurance, gas and future maintenance into consideration when they are making a decision on a car. Always look at the big picture when you are deciding on the affordability of a vehicle. You should never accept the “sticker price” on any vehicle. Whether you are buying a used or brand new vehicle – there is always some wiggle room for a deal. Negotiate the best price you can get and use the information you have gathered in your car search to agree to a fair price. Even if you don’t get the exact price you are looking for – it certainly can’t hurt to try. If you are in the market for a car and you are interested in obtaining financing for a used or new vehicle, fill out an application at CarCredit.com and get the financing you deserve.